Firing ceramic pieces in a kiln isn’t just applying heat. But you know that. What you might not know is how the kiln environment affects the pyrometric cones you are using to help you fire that kiln. Black Coring: When the interior of a ceramic item is black in color, caused by reduction of oxide components when heated too fast, resulting in residual carbon trapped from incomplete burnout of organic material. Radiation: The application of heat onto ceramic ware by radiant energy given off from a gas burner’s flame or an electric heating element. Reduction: An atmospheric condition within a kiln in which there is insufficient oxygen available. 1 A typical three cone sequence as seen through a kiln peephole. 2 Typical appearance of cones after a firing. Those experienced in firing ceramics know that kiln atmosphere can have a major influence on the reaction rates and properties of the ware. Since the point at which a cone bends is brought about by thermochemical reactions, we would also expect that atmosphere (1, 2) also influences when a cone will deform. Fortunately, the atmospheric conditions that influence product properties generally have related effects on cone behavior. The appearance of cones after they have been drawn from the kiln usually gives an indication of the kiln conditions during the progress of the cones through the fire. Cones going down in the wrong sequence or direction are often an indication of improper placement of the cones, improperly made plaques used to hold the cones, or some atmospheric effect. 3 Cones exposed to a reducing atmosphere. Reducing conditions are associated with gas kilns when the ratio of gas to air is adjusted so the oxygen content is very low. Under reducing conditions, the organic binder and any organic matter associated with the materials used in making a cone cannot fully oxidize (3). As a result, the cones will develop a black core from trapped carbon. Most ceramics will mature at lower temperatures when fired in a reducing atmosphere. In some processes, excess fuel is injected into the kiln to induce reduction, as is commonly done in the manufacture of bricks to produce a color effect. This process, called flashing, does not change cone deformation behavior. Black coring can also occur if the temperature is increased too quickly at the onset of a firing. Under such conditions, there is insufficient time for oxidation of the organic material within the cone to occur. The presence of a carbon core (black coring) can induce bloating (4) and change the bending behavior of cones, making them inaccurate. The presence of sulfur in kilns will have an adverse effect on cones that are manufactured with red iron oxide; those include cones numbered from 010 to 3. The red-colored cones will have a green to black appearance after firing in a reducing atmosphere. 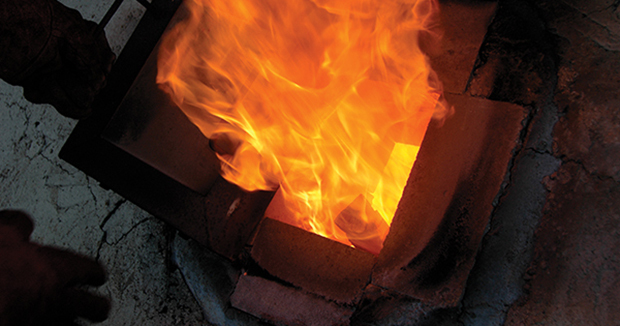 In kiln atmospheres that are either sulfurous or reducing, cones can also develop a rigid shell with a softened interior that is partially melted. These hard-shelled cones will not deform naturally. The surface of the cone will have a matte finish and appear rough with sharp edges. Hard-shelled cones do not bend in an arc but are stiff and will bend only at the base, like a felled tree. Hard-shelling may also be encountered due to the volatilization of boric oxide from the glass frit used to manufacture cones numbered from 010 to 3. Hard shelling causes cones to deform at temperatures higher than normal. To provide cones that will work in reducing conditions and in the presence of sulfur, Orton manufactures a twin line of cones that are formulated without red iron oxide. The iron-free cone series is identical in performance to the regular series of cones from 010 to 3. 5 Cone exposed to flame impingement. The presence of water vapor, particularly in larger quantities, will influence cone behavior. The action of water vapor upon a cone will make it deform sooner than normal. The reason for this is that water vapor diffuses into ceramic materials and causes changes in the vitrification process. This accounts for different behavior seen in firings done in an electric kiln as compared with a gas-fired kiln. Even though water vapor in the products of combustion can run as high as 20%, it does not take away from the value that cones can have, because comparable effects are usually found in the properties of the ware. Fly ash from the burning of solid fuel may settle on cones and influence their deformation. Likewise, volatile products such as salt fumes, lead, and zinc compounds may produce a surface glaze on the cone, which may influence cone bending behavior. The cutting tongues of flames may cause cones to develop melted tips, or cause abnormal deformation (5) if the cones are placed too close to gas burners. If possible, cones should be protected from flame impingement and kiln drafts. 6 Radiant effect on the cone to the right. Radiation from hot surfaces, or if the cones are placed close to cooler surfaces, will have some effect on cone deformation (6); so far as is practical, the cones should be protected from such conditions. From the above examples, it is evident that one can critically analyze kiln conditions through careful observation of the pyrometric cones drawn from the kiln. A properly responsive set of cones will invariably indicate a properly fired kiln, provided the heating schedule is suited to the ware. the author Thomas McInnerney is a graduate of The Ohio State University with a BS in ceramic engineering. He has worked with the Edward Orton Jr. Ceramic Foundation since 2001. He is currently the technical sales and support for pyrometric products. To learn more, visit www.ortonceramic.com. bloating, combustion, element, flashing, fly ash, iron, oxidation, oxidize, red iron oxide, reduction, set, short.